In many analyses, data is read from a file, but must be modified before it can be used. 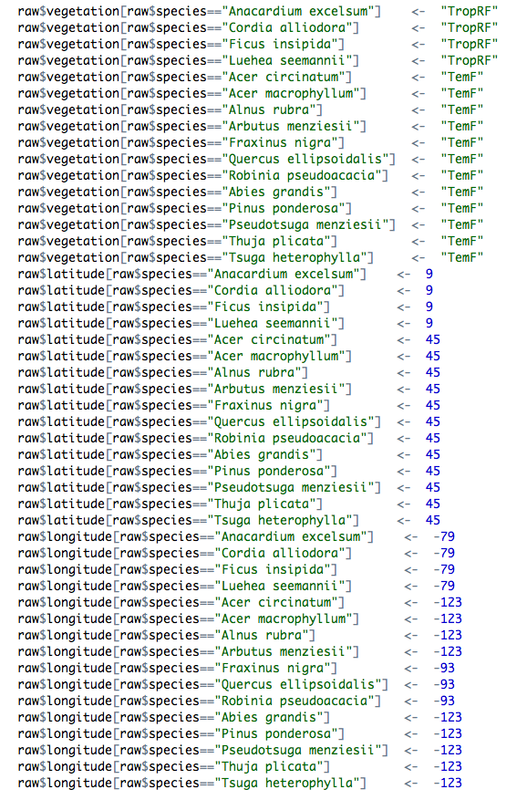 For example you may want to add a new column of data, or do a “find” and “replace” on a site, treatment or species name. There are 3 ways one might add such information. The first involves editing the original data frame – although you should never do this, I suspect this method is quite common. A second – and widely used – approach for adding information is to modify the values using code in your script. The third – and nicest – way of adding information is to use a lookup table. In large analyses, this type of code may go for hundreds of lines. You can see where the new value came from (it was added in a script), and modify it later if needed. Long chunks of code modifying data is inherently difficult to read. There’s a lot of typing involved, so lot’s of work, and thus opportunities for error. It’s harder to change variable names when they are embedded in code all over the place. lookupVariable is the name of the variable in the parent data we want to match against. If left blank, change all rows. The large block of code is now reduced to a single line that clearly expresses what we want to achieve. Moreover, the new values (data) are stored as a table of data in a file, which is preferable to having data mixed in with our code. You can use this approach You can find the example files used here, as a github gist. Acknowledgements: Many thanks to Rich FitzJohn and Diego Barneche for valuable discussions.